Hello dear reader. So I’ve had my iPhone 4 for a week now and I thought that after the excitement of the Apple Store line, the pleasure of un-boxing and setting up, it was time to share my thoughts on the device. I’d had my much-loved iPhone 3G for two years, so the advent of iOS4 made it an ideal time to upgrade to the latest version, particularly because many of the iOS4 features wouldn’t operate on my old 3G. Holding iPhone4 in the hand is a sublime experience. The glass screen and back are so smooth to the touch that together with the overall weight of the phone, it makes simply holding iPhone 4 somehow satisfying. Strange you may think but perhaps you have to feel it to appreciate what I mean. I have quickly got used to the flat back and slightly angular sides (compared to the 3G) and the metal buttons on the metal sides are more direct and feel more solid in use. In day to day use iPhone 4 is certainly faster, due in no small part to the faster chip and more RAM. It may be an illusion but the 3G and WiFi network speeds are faster as well. Another thing which particularly impresses me is the superb high resolution screen. Much has been made of the Retina Display containing more pixels than the eye can detect; whatever, the result is that your view the icons and text is “pixel free”, i.e. you can’t see the pixels at all! Battery life seems good too, although I haven’t carried out any tests yet. Other highlights for me include the 5 megapixel camera. At last iPhone has a camera which I will enjoy using, the old one just didn’t take pictures I wanted to keep; now that has changed and I anticipate taking many more photographs using my “best camera” (the best camera, as everyone knows, is the camera you have on you when you need one!). The HD video looks good too, I’ve wanted to dabble in video for some time but have not been able to justify purchasing a video camera since my old VHS “brick” expired many years ago. So, look out for some “home movies” appearing here in the near future! There’s also been much talk about the real benefits of folders and multitasking. I spent a couple of hours sorting everything into folders which means I currently have just two pages of Apps. Neat. I’ve also found multitasking very useful, especially since I had to reconfigure quite a few Apps on the new phone. This meant dipping in and out of my password manager (1Password) for login details, etc. (My memory isn’t what it was!). Being able to switch back and forth using multitasking with copy & paste was a real boon, this wouldn’t have been possible with third party apps before. Cons. There have to be some cons, right? Well frankly not many. I have been able to replicate the “Antenna Problem” by bridging the gaps in the metal surround, however I personally don’t hold my phone like that so it’s not much of a problem for me. It’s still something Apple should resolve though. The only other complaint I have is that I have to be careful where I put iPhone 4 down. Place it on the slightest incline, such as one’s knee when seated, or a sofa arm and – presumably because of the low drag coefficient of the smooth glass back – it almost immediately starts to slide downhill. Rest assured it has only fallen off the sofa arm once! So there endeth the lesson according to this Apple fan. Biased? Probably. Smitten by the iPhone 4? Definitely. Yesterday was iPhone4 launch day. At silly o’clock I made my way to the Apple Store at Brent Cross and queued up for my reserved iPhone4. Wow, what a queue! TBH I had expected a line but not one of that magnitude. There were actually 2 lines, one for people with reservations and one for the optimists. I lost track of the time which seemed to pass quickly, because we were all like-minded Mac Geeks so had lots to talk about! Apple staff handed out bottles of water – thanks guys. When it was my turn, time seemed to speed up and I found myself back outside the store clutching my Apple carrier bag within 10 minutes. Great service! I’ll post my thoughts on the new device soon, once I’ve had a serious play with it! So there are alternatives to the iPhone but the BB Storm isn’t one of them. stephenfry.com. Some useful info in there from a self-confessed gadget nerd. But 4 iPhones? That’s just excessive Stephen! I can’t say whether I agree with the detail, all I can say is that I prefer my iPhone to the BB Pearl my daughter uses. But that’s just me. Having said that we’ve made some progress with Mac connectivity, syncing iCal to the BB calendar which she finds quite useful and RIM’s push email is already pretty good. My wish list for the iPhone? Well being able to sync iCal without connecting to my Mac, i.e. OTA without paying for MobileMe. Sitting in the car while I wait for my daughter, thought I’d try out the iPhone App. 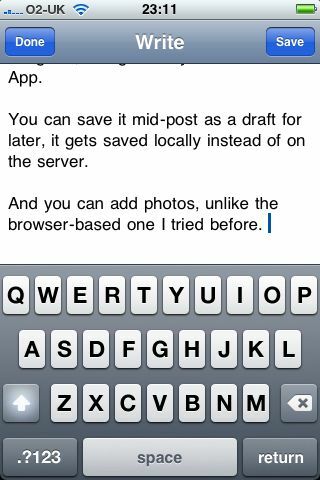 You can save your work mid-post as a draft and come back to it later, it gets saved locally instead of on the server, which could be an inconvenience, time will tell. And you can add photos, unlike the browser-based one I tried before. So I’ve added a couple of screen shots so you can see how it works, although you can’t see these in preview mode. Well let’s publish it and view the results! 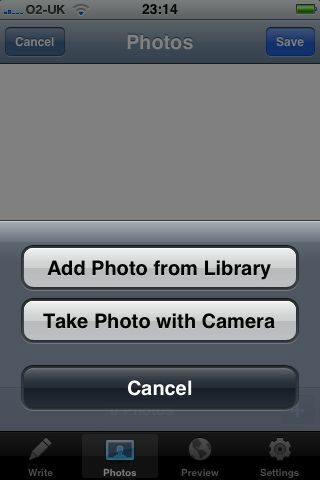 Edit: Pictures are displayed with the last one added displayed first. Editing images in the iPhone App will be nigh on impossible as in edit mode the full HTML is displayed and without Cut & Paste… Still that’s probably not something I’d worry about, it’s really all about fast posting on the move which it seems to do rather well. I was reading a blog yesterday where the author had used a WordPress plugin to generate a customised version of his WordPress blog to suit the iPhone display. I think this only works if you host your own blog, because WordPress doesn’t allow mere mortals to add plugins. Still, not being too disheartened I decided to experiment with an “iPhone sized” version of my web site. iPhone is perfectly capable of displaying any website in all its glory, however I thought it would be fun to develop a version which was customised so you don’t have to scroll or zoom to see the full page. At the moment I’ve just coded a single page to see how it works. It’s just a first attempt and needs some work, e.g. I need to fix it to stop “floating”. If you want to have a look just click on the link at the end of this post. Of course if you don’t have an iPhone you won’t be able to appreciate the goodness.